Along with many miles of hiking, my friends and I also took in a few sites and dined at many good restaurants. After we hiked both The Petroglyph National Monument and Kasha-Katuwe Tent Rocks National Monument we headed on the Low Road to Taos. We certainly worked up a good appetite so we headed to town in Taos and had dinner at Doc Martin’s Restaurant at the Historic Taos Inn for tasty New Mexican food and of course drinks. 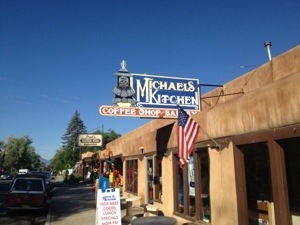 The next morning before heading to Taos Mountain Village we has breakfast at a diner that locals frequent as well as travelers – Michael’s Kitchen. Along with hearty breakfasts they also offer cinnamon rolls the size of dinner plates. 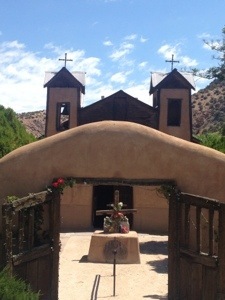 When we headed to Santa Fe we took the High Road and stopped at a small town named Chimayó. 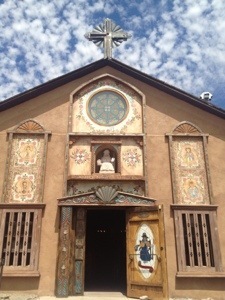 Tucked into the foothills of the Sangre de Cristo mountains, tens of thousands of pilgrims make their way to see the tiny church there – El Santuario de Chimayó. There are many stories of miracles that have taken place there. The architecture itself is beautiful to behold. A few steps away is Santo Niño Chapel which now has been dedicated in honor of children. 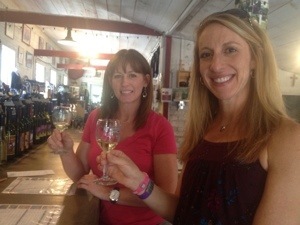 Once we were back on the High Road to Santa Fe we stopped to see a vineyard and taste the local wine. The city of Santa Fe is the state capital and also an artists mecca. 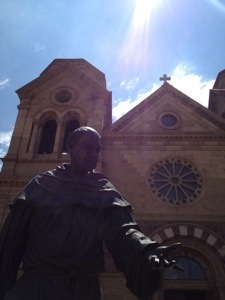 The patron saint of Santa Fe is Saint Francis of Assisi, in the center of town is a church dedicated to him. After we visited the church we headed up to see the galleries. Streets and streets filled with all types of art – paintings, sculptures, textiles – a sensory overload! 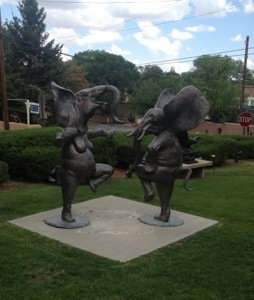 One gallery had a garden of sculptures and my favorite was the dancing elephants in the center. 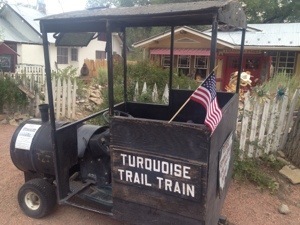 On our return drive to Albuquerque we took a route called the Turquoise Trial. Along the Trail we stopped at a former mining town to visit the shops and see the colorful buildings. I purchased a pendant made of Cerrillos Turquoise which is mined near by in New Mexico. Most turquoise today is mined in Nevada and all but one mine in New Mexico is in the southern part of the state. I was pleased to find a piece of this very green turquoise that was mined locally. 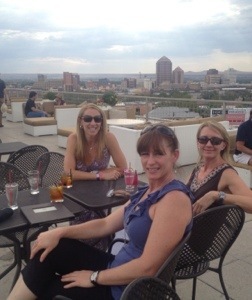 Our last evening in New Mexico we enjoyed cocktails at the roof top bar in our hotel before dinner. Two of the greatest pleasures in life for me are seeing the beauty of this world through travel and enjoying each day with those most dear to me. My vacation to New Mexico offered the best of both. I lived there for a dozen years while in graduate school. I miss it terribly! Nothing like the smell of rain in the desert. Ahhhhh. But it is so very rare. 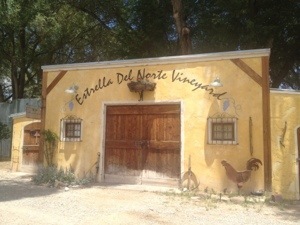 I should have read your blog sooner, I could’ve suggested a few even more awesome places (El Pinto on Rio Grande Blvd and El Rancho at Chimayo!). Glad you had a great time! We’re headed there in April/May for a conference. I cannot wait! Thank you Sandra! We did have lunch at El Rancho! I didn’t have a picture so I didn’t mention it. 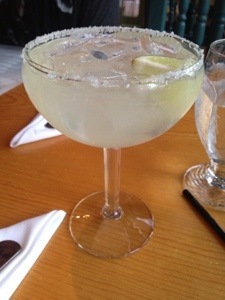 Fabulous food and drink! No kidding! they had a fire when we were there, so I didn’t get to eat–but their green chile is to die for. As is El Pinto in Albq. This just looks like a lot of fun!